Places to visit in Bangalore with kids - There are many interesting places for Kids to visit and enjoy in Bengaluru. When you are in Bangalore with your family, you'd like to take your kids to have some fun-filled time for them. These are some of the popular places you can take your kids in Bangalore. 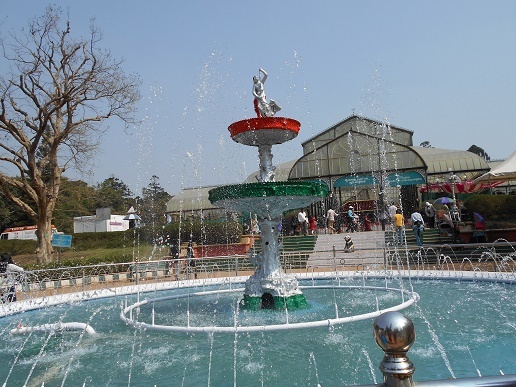 Lal Bagh Botanical Garden - The best place to experience the freshness of flowers and plants, cool breeze, a good walk along the lake, glass house and rose garden. No wonder Lal bagh and Cubbon Park are considered as the lungs of Bangalore. 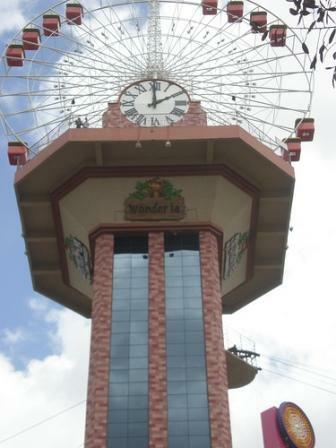 Wonderla - Located on Bangalore-Mysore Road, Wonderla is the newest amusement Park where not only kids, others can also spend a wonderful time. It is ranked as India's biggest amusement park. Many water rides and the latest imported land rides are available here. The high-thrill rides include Maverick, Y-Scream, Drop Zone, Insanity etc. The families can also enjoy a number of water-based amusements such as Wave Pools, Play Pools, Lazy River and a variety of Water Slides. Bal Bhavan - Located in the famous Cubbon Park, it is a great place for the children to enjoy their time.They can enjoy a 1.5 kms ride on a toy train through the park. A Doll's museum is another attraction for them here,and a mini park with swings, horse rides and tree houses. Children's films and stage plays are screened in the Vijayaranga Theatre here. Also there is a clock tower and a lovely grassy amphitheatre. There are open pavilions with teracotta roofs arranged in a crescent. Aquarium - Also located in Cubbon Park, in an octagonal building, the children can enjoy a fascinating trip to the underwater world. It is a fresh water Aquarium, exhibiting a variety of fishes, which would be a great place in Bangalore for kids. It is open from 10 am to 5.00 pm on all days except Mondays and second Tuesday of every month and on general holidays. 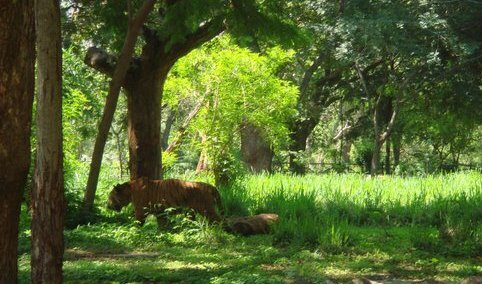 Bannerghatta National Park - A visit to the National Park is a great place in Bangalore with kids. 25 kms away from the city, Bannerghatta National Park is located in a picturesque place. They can have a glimpse of wild animals like bisons, lions, elephants and panthers in their natural habitat. They can also see the lion tailed monkeys, the snake park, the museum, birds, cheetah and other wild animals. They can also see here an ancient temple of Champakadharmeswara built by the Hoysalas in the 12th century AD. If interested, a lion safari can also be arranged here with the park officials. The Heritage Centre & Aerospace Museum - It is a great place for the students and adults to see and learn the life size display the age old aircrafts, photographs and a chance to use the flight simulator. Photography is allowed here. The families can visit this place in Bangalore with kids. Crazy Waters - This is a Water Park which provides the kids the right kind of thrill, splash and excitement.The kids can also have the opportunity to hire the swim costumes for rent to have more fun. There is no scarcity of places in Bangalore for kids to enjoy and merry making during their holidays. Neeladri Amusement Park - Set on a splendid 30 acres of land, it is the combination of an amusement park and a water park in the city. The kids can spend their time in a fun-filled atmosphere, where fun rides, a video games arcade, Roman type amphitheatre, restaurants, ice cream parlours and chaat stalls are available. The water park even provides locker facilities to the visitors. Lumbini Gardens - Lumbini Gardens is situated on the Nagawara lake front near Hebbal. Boating facilities and the help of professional lifeguards are available here. There is also leisure complex with a variety of entertainment activities for the children. Food courts and restaurants are also there. Fun World - Fun World is a 12 acre Disney Land Like Amusement Park near Palace Grounds. The children can enjoy Atlanta Roller Coater, Caterpillar Rides, Rounded Train and Toy Rides. Jawaharlal Nehru Planetarium - Located near the Raj Bhavan, the Planetarium is a visual delight for children and adults alike.The main attractions are the Sound and Light show - "The Sky Theatre Show" about the marvels of the universe, the planets and the solar system. Entry is restricted to children below 5 years.The Planetarium is closed on Mondays and second Tuesday of the month. The families can visit this place in Bangalore with kids. Innovative Film City - Not only the kids, the whole family can have great fun and entertainment here. Apart from the main attractions like Wax Museum, Mirror Maze, Go Karting Zone, Dinosaur Park, Ripley's Believe It Or Not etc.there are several others, each with a different theme. The whole family can have a wonderful time here with rides like Carousel, Roller Coaster, and Shark Attack. Want to watch a video? Enjoy this to know what is there in Bangalore with kids.